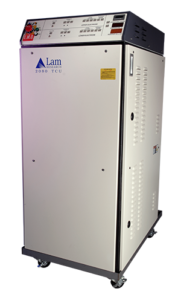 The LAM TCU 20/80 chiller is a dual channel temperature control unit, used predominantly on the LAM 4000 Etchers Series. The 20/80 was designed to provide independent temperature control to the process chamber’s upper and lower electrodes all from a single chiller using a mix of DI water and Glycol. Trillium provides both service and refurbished 20/80s in support of customers globally. With access to OEM parts direct from LAM, Trillum can provide expert level support on your existing 20/80 fleet.